By Xah Lee. Date: 2014-10-30 . Last updated: 2016-02-27 . Docker is basically a software container layer that lets you run a app of many components (database, server, frameworks, etc.) as if you are running one single software. You build your software, all the components (the database, server, libraries, tools, languages), into one binary file called image. Then, you can run this image, on any machine that has docker installed. 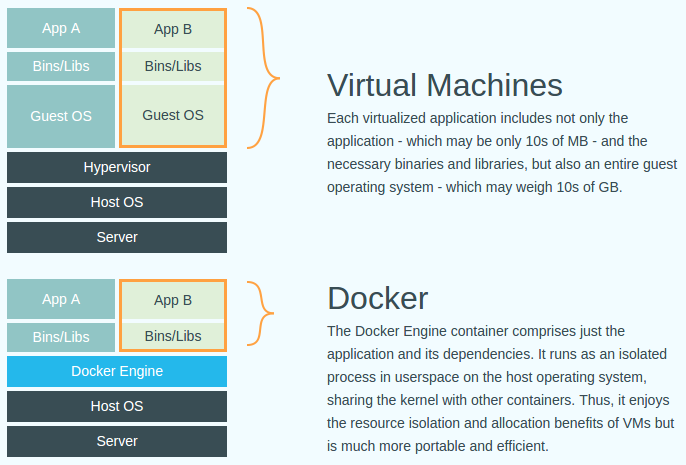 Docker is like a virtual machine, but without the OS component. Here's a picture. Introduction to Docker, by founder Solomon Hykes. Docker Tutorial - What is Docker and Docker Containers, Images, etc? Docker is written in golang. Docker Engine has 2 parts: ① a server (daemon). ② a client, that controls the server. docker help → list commands. docker version → show the docker server and client version number. docker images are hosted at “Docker Hub Registry” (as in “github”) at https://registry.hub.docker.com/. docker search name → search docker images. docker run image_name command → run command in docker images named image_name. when a command is run in a container, the container is said to “started”. Once the process finishes, the container “stopped”. docker run niceHome/myNiceApp echo "love you"
-author="": Author (eg. "John Hannibal Smith <hannibal@a-team.com>"
docker inspect image_id → show info. docker images → list images on the host. What's Apache Ant, Apache Maven, What's the Difference? Python: What's PyPi, pip, easy_install, setuptools?